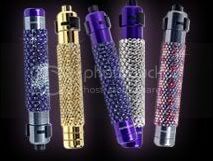 Pepperface has introduced a line of high-end pepper spray canisters that are gold-plated and studded with Swarovski crystals. So if your girlfriend likes shiny things, but you haven’t yet been able to convince her to carry some protection, this might be a happy medium for the two of you. The cans will run you from $55 to $195 each.